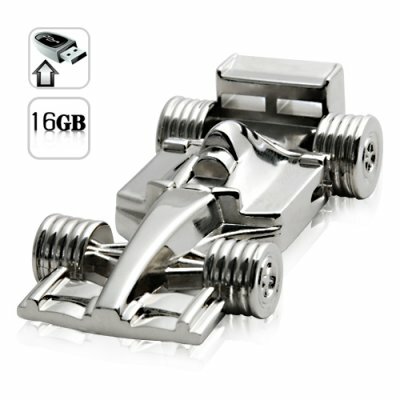 Successfully Added 16GB USB Flash Drive - All Metal F1 Racecar to your Shopping Cart. These days a USB flash drive is as necessary as your house keys. Whether you are taking large work files back and forth from the office or are sharing pictures, videos, and music with friends, nothing beats the convenience of a USB storage drive. Well, why not make sure the one you get fits the person who is going to carry it? This all-metal model F1 racecar is the perfect gift for any serious race fan, or simply anyone who wants a nice table decoration with an incredible 16GB of flash memory! This is more than enough memory to store your entire music collection, hours and hours of your favorite movies, or even your entire photo collection! This cool F1 racecar USB flash drive is in stock right now, at an unbeatable factory direct price, and available for immediate express shipping. Order in bulk now and make a handsome resale profit, or buy a few for yourself and your guy friends as great gift. The K57 racecar USB flash drive is brought to you by the leaders in wholesale electronics, Chinavasion! How can you offer 16GB at such a great price? Because we source all of our products directly from the factory. This means we don’t waste time or money paying for middle men, and in return, we can pass the savings on to you!